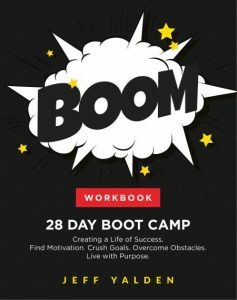 If you have been following The BOOM Podcast, you already know that youth motivational speaker and Amazon bestselling author Jeff Yalden has been laying out the daily steps on his new workbook The BOOM 28 Day Boot Camp: Creating a Life of Success. Find Motivation. Crush Goals. Overcome Obstacles. Live with Purpose. “I am really trying to spell this out and make it as simple as possible, and excuse the term – I am trying to idiot-proof it for the people that have trouble refocusing, staying on a plan, creating a plan and staying consistent every single day,” Yalden said, adding that he wants you to go at your own pace. Yesterday, the message was all about SMART Goals, and Yalden talked about a book written by a friend of his, speaker and author Jake Ballentine. “I encourage you to read Your Number One Goal: Very well-written – very simple – and just really inspiring,” he said. The BOOM Boot Camp workbook contains actionable messages based on Yalden’s Amazon bestseller, BOOM! One Word to Inspire Action, Deliver Rewards, and Positively Affect Your Life Every Day. Go back over your plan. Do you see it? Are you able to feel it? When you look at your plan, is it doable? Can you manage your life and fulfill making this plan happen? Remember: This is not about perfection. It’s about progress. Yalden wanted to let you in on a little secret. He said probably 10 percent of the people that buy this book will actually finish it. “If it takes you two months to create a plan – to have a goal and to achieve that goal – then you are better off than 90 percent of the people that buy the book with all the intentions in the world but never finish it,” he said. Do this on your own terms and at your own pace. Rewrite your plan if you need to. But don’t go on to Day Two until you are sure you are ready. Maybe something happened to you yesterday and you need to refocus. Perhaps this new something is a priority. It’s OK to create a new goal. Adopt a new mindset and leave anger and bitterness behind – no matter what happens – and choose gratitude instead. Learn from your mistakes. Reevaluate your situation daily. Take time for you. Self-care is not selfish.